"The truth of the matter is, I fall in love with the whole family: father, mother... I like girls with nice parents." In this fifth and final film in Fran�ois Truffaut's autobiographical saga, Antoine Doinel (L�aud) is now in his thirties and faces his past in a series of encounters with now familiar faces. The director makes good use of flashback material from the four previous films, both to remind series followers and to provide background exposition, neatly accommodating his character's resolution. Antoine and Christine (Jade), his estranged wife—whom he wooed in Stolen Kisses and married in Bed & Board—meet to sign their divorce papers. This is not just any divorce, it is France's first no-fault dissolution, and the press surround the ex-couple on the courthouse steps. At the edge of the crowd is Colette (Marie-France Pisier, of Antoine & Colette), who recognizes the young man who all but stalked her years ago. Far from the carefree girl he knew, she is now a lawyer, in love with Xavier, an arrogant bookseller (Mesguich). Their paths will cross again, but not quite yet. "Always running. Hasn't changed a bit." Antoine, ever the storyteller, is struggling to balance his parental duties with his romantic life. He's in love with Sabine (Dorothée), but as is his pattern, continually disappoints her. When he breaks a promise to her in order to see his young son to the train (a promise he made to Christine), Sabine has had enough and locks him out. At the station, Antoine sees Colette on a train heading south and in a moment of ill-conceived passion, he jumps on board. Colette has Antoine's book in hand, and over the miles she flips through the pages (a clever and convenient device for the director) and recalls their younger days. The train covers some distance before they meet, and he rides with her long enough to discuss the past and understand their lives now, for better or worse. Before the story ends, Monsieur Lucien (Bertheau), his mother's last lover, will call on Antoine and help to explain a mother's conflicted motivations toward her son; Christine and Colette will meet, both on their way to persuade Sabine to reconcile with Antoine, for whom they each still have great affection. Will Antoine win Sabine back? Has he come to understand the nature of responsibility—can he stop running? As we have followed the peccadilloes of Antoine Doinel, we have followed the career of François Truffaut. The anarchic wild child is now a man who will be credited with having redefined his craft, and if some of that youthful thrill is gone, it has been replaced by other, more substantive elements. With Jules et Jim and Day for Night behind him, and 1980's The Last Metro next on his slate, Truffaut is a self-made man. His confidence as a filmmaker is fully formed, and his early recklessness is now reined by a masterful hand. 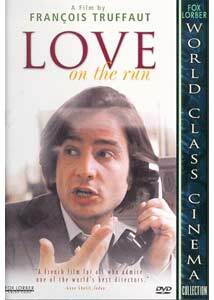 In L'Amour en fuite, Truffaut takes a fond look back at his journey in the guise of his alter-ego. While Doinel continues to struggle with commitment, Truffaut bids him farewell, his future unresolved. Jean-Pierre Léaud is ever an extension of Truffaut, but never in the way of puppetmaster; Léaud continues in his organic approach to Antoine that is uniquely his own. Claude Jade has matured along with Christine, a woman of substance and infinite patience. The two are as charming together as ever, and more comfortable than most married couples, even if their characters' union is heading for dissolution. Dorothée is adorable—and believable—as the headstrong Sabine, and it is a delight to see the ever-handsome Marie-France Pisier return as a Colette who has a few life-altering experiences behind her. Followers of the director and his Doinel character should find satisfaction in Truffaut's 20-year, five-film project. Each entry carries its weight individually; collectively, they make an ambitious and entertaining character study that succeeds with charm and confidence. Image Transfer Review: Presented in 1.66:1 (OAR), this is another decent transfer in Fox Lorber's Truffaut series. There are occasional flecks present, but they are kept to a minimum and far from distracting. The digital process preserves the natural grain and texture of the film. Audio Transfer Review: The French mono is uncomplicated, which is satisfactory here. There is some hiss in exterior scenes but dialogue is never marred. Alain Souchon's title song sounds its age, but lays the foundation for a very entertaining title reel. Extras Review: As with the other titles in The Fran�ois Truffaut Collection, only 6 chapter stops are provided by which to navigate this film. Ludicrous. Filmographies are include for L�aud, Jade and Truffaut. Additional production credits fill two screens. Collection trailers, presented in widescreen format, include: The 400 Blows (Les Quatre cents coups), Jules and Jim (Jules et Jim), Two English Girls (Les Deux anglaises et le continent), The Last Metro (Le denier métro), The Woman Next Door (La Femme d'à côté), Confidentially Yours (Vivement dimanche! ), Stolen Kisses (Basiers volés), The Soft Skin (La Peau douce), Bed & Board (Domicile conjugal) and Love on the Run (L'Amour en fuite). L'Amour en fuite is not Truffaut's best film, but it has all the right elements with which to make true cinematic entertainment. Tidily drawing up the loose ends of his serial character with comedy, romantic suspense and more than a little affection, the writer/director delivers the goods for those who have taken the ride with him.